Oppo is back with a sliding camera on the new Oppo Reno but this phone offers a lot more bang and is priced much more modestly. Never one to shy away from experimenting, Oppo continues to innovate with the Oppo Reno by adding a sliding "shark fin" sliding mechanism on top that houses the selfie camera and rear flash. 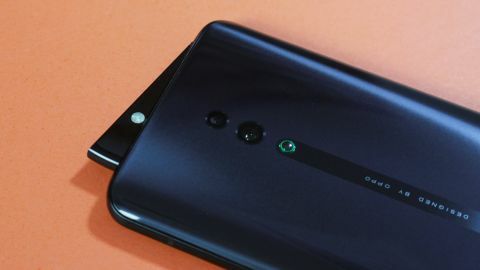 Oppo is releasing two versions of the Reno in the UAE and Saudi Arabia - the first is the standard version that we are looking at today and the other is the 10x Zoom version with a zoom range that rivals Huawei's P30 Pro. While the Reno is here, the 10x Zoom version will be available in "about a month's time." Pre-orders for the Oppo Reno start on April 17 in the UAE and April 18 in Saudi Arabia. The units are expected to hit store shelves on April 22 and 25 for the UAE and Saudi respectively. The Oppo Reno 10X Zoom Edition will follow at a later stage. Oppo has set the price for Reno at AED 1,899 (around $520, £400, AU$720) in the UAE and SAR 1,899 in KSA. There is only one configuration available which is with 6GB RAM + 256GB storage. That is a great price for what you're getting. We expect the Oppo Reno to launch in other countries, including the UK, soon with a European launch for the Reno series of handsets slated for April 24 - where a 5G variant of the device will also be announced. Like most flagship phones, the Oppo Reno has a symmetrical design with glass on the two sides and a metal frame surrounding the unit. While a glass back feels premium, it's very much on the slippery side. Right above the volume keys is the SIM tray that can accommodate two nano SIM cards. Sadly, there's no microSD expansion slot- at least not in the dual SIM version released in the Middle East. At the bottom sits the USB Type-C connector, a bottom firing speaker and a 3.5mm headphone jack. Most flagship phones of today sacrifice that in the name of design so we're happy that Oppo decided to keep it. On the top sits the "pivot rising structure" that holds the front camera, flash and earpiece, and mechanically folds into the body. This gives you a full display without any notches or punch holes. We've seen a somewhat similar sliding mechanism in Oppo Find X but what makes the Reno better is that you also have a fingerprint sensor inside the display which means that you can unlock the phone without requiring the camera to pop out. Oppo says it has tested the camera for 200,000 standard uses which should make it last for a few years. There's a built-in drop protection mechanism as well that will automatically close the "fin" in case the phone slips out of your hands. Oppo is releasing the Reno in two colors- Ocean Green and Jet Black both of which look subtle and beautiful. Sadly, there's no IP68 rating on either the Reno so you have to be careful taking it near water. The 6.4-inch OLED display has an FHD+ resolution and is well calibrated with colors that look natural. It's not quite as striking as the display on the Samsung Galaxy S10 line-up, but keep in mind that this phone costs half as much. Oppo claims a screen to body ratio of over 93% and with no notches and a minimal bezel on the top and sides, the phone certainly looks impressive. There is a slightly larger chin at the bottom but you'll hardly notice that after using the phone for a few times. The Oppo Reno comes with a new "Night Shield" mode that's supposed to reduce the blue light on your phone without really affecting the overall colors. It's something similar to what we saw on the Galaxy S10 and will be testing in our full review. The 48MP camera uses Sony's IMX586 half inch sensor and has a f/1.7 aperture which helps improve light sensing capabilities. Oppo is introducing Ultra Night Mode 2.0 with the Reno that can leverage AI, HDR, and multi-frame noise reduction. This will help with grainy or shaky photos in low lit conditions. Unlike Huawei's P30 Pro, Oppo's approach to low-light photography is to not artificially brighten the image but to keep the lighting closer to what your eyes see while enhancing colors at the same time. There's a secondary 5MP camera on the back of the Oppo Reno fixed at 2X zoom and helps with portrait shots. We'll definitely be putting the camera to work in our review. Positioned as a mid-end device, the Oppo Reno felt extremely fast and zippy. It's powered by the mid-ranged Snapdragon 710 processor with 8GB of RAM and 256GB of storage. Considering there is no microSD expansion slot, that rather large storage should help for your apps, games, photos and videos. Reno also comes with the latest Color OS 6 which is Oppo's skin based on Android 9.0. It's quite different to stock Android and has a few rough edges but runs super smooth and is good looking. The pricing of AED 1,899 (US$ 517) makes the Oppo Reno highly attractive to what it offers- a good screen, 256GB of storage and an excellent camera, all wrapped up in a beautiful design with a slide out camera that's sure to get noticed.